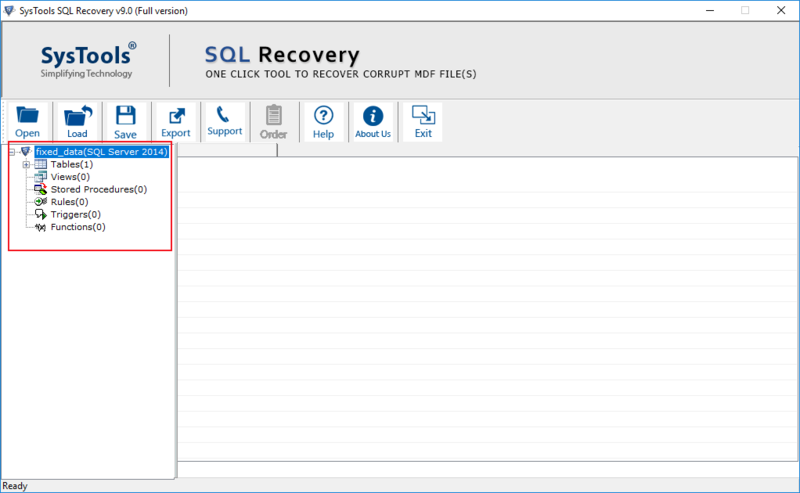 SQL Recovery Tool found to be helpful utility for repairing MDF & NDF database files from various corruption errors. I would highly recommend this tool for recovering and repairing your issues related to SQL Database Corruption. SQL Recovery Software has been highly suggested by users among other softwares for recovering corrupted and deleted database records. Cnet awarded SQL Recovery Software as the most efficient & reliable tool for corruption free database files. 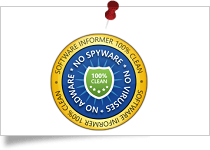 SQL Recovery Tool has been awarded 100% secure with 4.9 star ratings by Software Informer. The SQL Repair Tool awarded as 100% Virus/Ad/Spyware free tool by Softpedia. 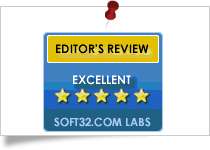 Soft32 has awarded SQL Database Recovery software for recovering deleted database records effectively. 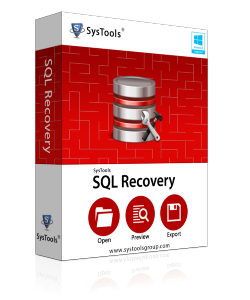 SQL recovery tool scans and recover all database components such as stored procedures, tables, rules, functions, triggers, etc from the database. It can also recover Primary key, Unique keys, various data types in SQL Server Database. SQL MDF recovery software is capable to repair both MDF as well as NDF files. Also the software recovers data from multiple NDF Files of SQL Server Database.For this, you need to choose NDF option of software to add associated NDF files. SQL database Recovery tool provides you two different scanning options for your corrupted MDF Files. You can select Quick scan mode if your database has normal corruption level or choose Advance scan mode for highly corrupted SQL Server database files. There are numerous reasons when the tables data get either accidentally or unknowingly deleted. At this point of time, you need to recover your deleted data that you have lost. By using, SQL Recovery Tool you can easily recover deleted data from SQL table. 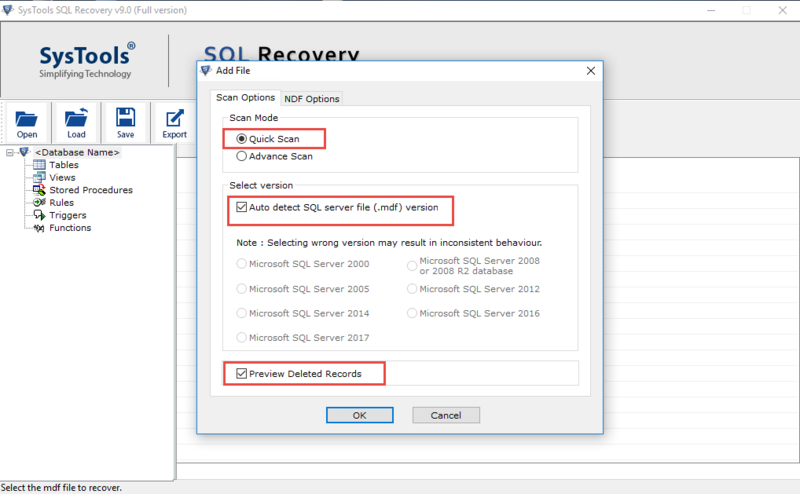 After completing the scanning process, SQL database recovery software provides you option to preview all the scanned & recovered database objects like tables, column, keys, indexes, triggers, procedures, functions, etc. If user does not know the SQL Server version of its MDF file , the SQL repair tool has an option to Auto Detect the version of SQL database MDF & NDF files or if you know the version of your SQL server, you can choose it manually. Page level corruption, Meta corruption, SQL Error 825, 945, 5171,3414,1902 are issues related to corruption in SQL Server which makes database inaccessible.SQL recovery tool is capable to repair all these issues and make your database accessible. SQL repair tool provides an option to export selective recovered database component that you want. One can discard the bulk data that is not important. This will help to perform the fast exporting process as well as manage compact MS SQL Storage file. SQL Database Recovery software provide users to easily export recovered SQL database file items as SQL Server Database or as SQL Server compatible script. To export in SQL Server Database, you need to give Server credentials or if you want to export as compatible script,.sql is created which you can save at your desired location. After completing the scanning of corrupted database files, the software allow you to save scanned report in .str extension at your desired location. This enables you to prevent re-scanning of your database files from the next time.For this, you just need to load this .str file to the software to proceed for further process. 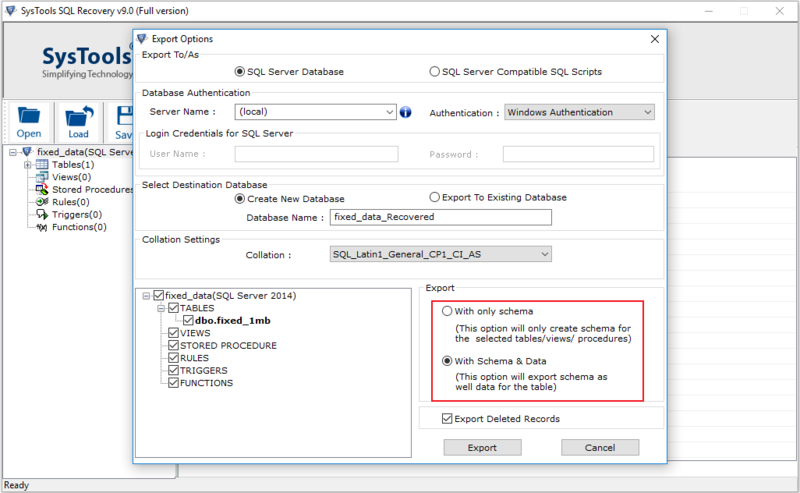 SQL Recovery tool provides you to give options to export the database objects in two ways. One can export the database elements with only schema & other is with Schema as well as Data. SQL recovery software is compatible with both Windows & SQL Sever. The tool supports Windows 10 & all below versions & SQL Server versions 2016, 2014, 2012, 2008, 2008 R2, 2005, 2000. Demo version of SQL Server Recovery Software allows to preview all recovered components and export 25 records of each table & 5 other database objects. If a user is operating Windows OS 10/8.1/8/7/Vista, then user have to launch the tool as "Run as Administrator". Does SQL recovery tool capable to repair corrupted MDF file? If yes, What is the procedure? Step 1: Launch SQL database Recovery tool and open corrupt Sql MDF file. Step 2: Select scan mode according to the level of corruption & choose sql server version. Step 3: Preview recovered database items in the software. Step 4: Click on Export button to export the file in SQL Server database or in .sql script. Step 5: Select option to export the files with only schema or schema with data. Can I be able to recover deleted records from SQL table using SQL Database Recovery Software? Yes, you can recover your all deleted database objects like Views, Triggers, functions, tables, stored procedures etc from SQL Recovery Tool. What are the options for saving my recovered database files in SQL Server Database? SQL Database Repair tool provides you two different options to export your database file. You can either save in your SQL Server database or can save as .sql script at your desired location. Does this SQL Repair tool recovers from Ransomware affected database files? Yes, SQL Recovery tool recovers your database files from ransomware. Can I migrate data from one database to another database using SQL Recovery software? Yes, SQL Database Recovery software can transfer your data from one database to another in SQL server. Is there any file size limitation to recover data from damaged database? No, there is no such limitation to recover corrupt SQL database file. Is there any limitation in demo version of SQL repair tool to recover deleted SQL database file? Yes, the demo version of SQL MDF recovery software exports only 25 database records from each table. If you want to export more database items, you have to purchase Freeviewer SQL Recovery Tool. "I was completely clueless when my SQL Server database displayed SQL error 5172. I tried all the possible ways to fix it but it all get failed. 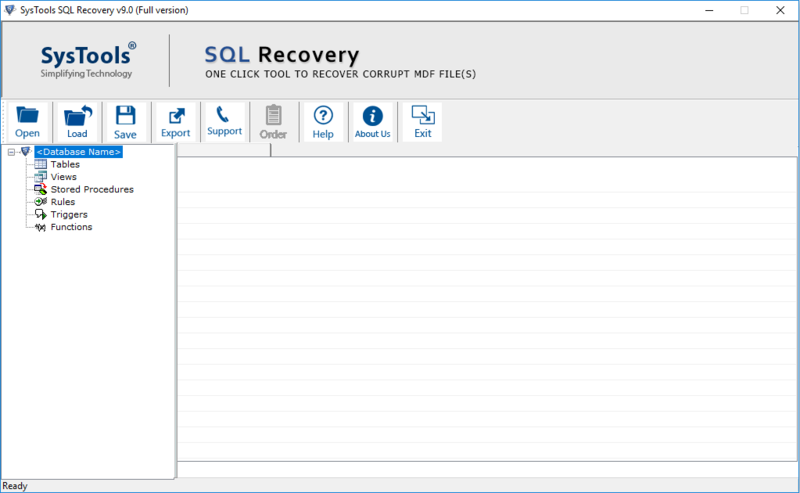 After surfing alot, I came across Freeviewer SQL recovery tool.I installed this tool and able to recover both MDF & NDF database files with so ease." "SQL Database Recovery Software becomes my rescuer when I mistakenly deleted my tables data and I had no backup!! 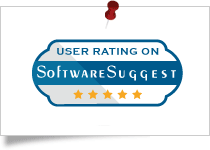 The recommendation to use SQL Repair tool proves to be worth it as I was able to recover my deleted database objects." "I was agitated as I was not able to access my SQL server database. I was so confused as I was not able to give my db report to my clients. After searching a lot, I found Freeviewer SQL Recovery Tool. It becomes my savior as my database got corrupted and hence, recover my all database objects without any complication." "I was confused as I have to save my mdf file to .sql script so that I can use it further. SQL Repair Tool found to be helpful as it has an amazing feature to save your files at your desired location in .sql script. I installed the software and saved my file in my desired location. Thankyou Freeviewer!!!"